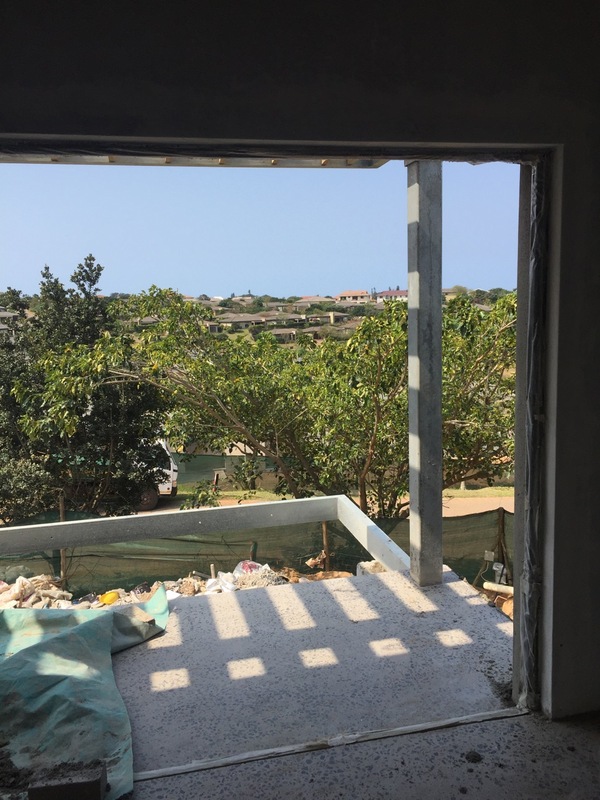 It’s very evident now what we have, there are a lot of finishing items to attend to, carpentry is a big one and final fixtures and fittings, but there’s enough in place to appreciate what it will become, family have been visiting throughout. Shower floors are in, you’ll see the different stone aggregate now. Raked ceilings are in. Went with 50mm Lambdaboard® by rigifoam which has excellent thermal properties and crush resistance but also skims and paints well. Roofing contractor has done well, even down to the quadrant trim pieces around the complex truss profiles. Charcoal aluminum doors and windows are in. 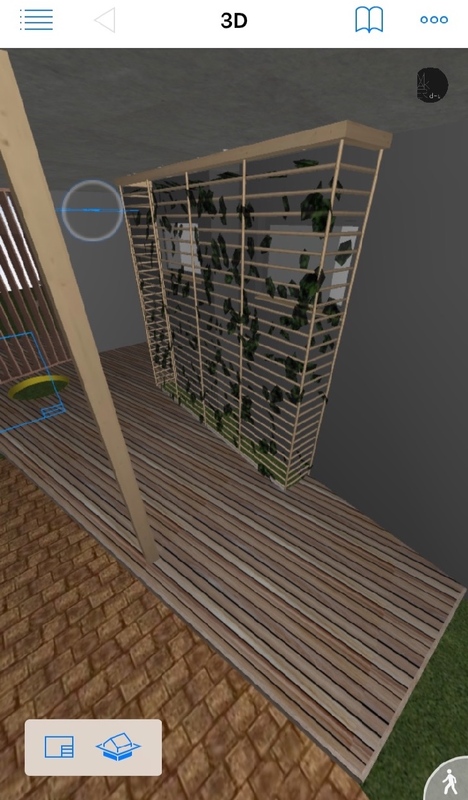 Folding Stack doors with the first leaf incorporating top hung sections so as to let air flow without allowing toddlers to escape to the pool beyond. 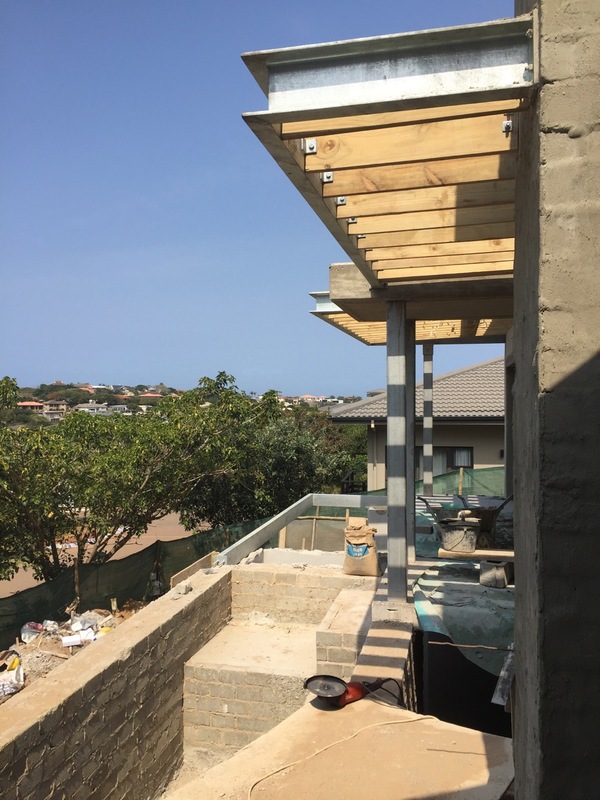 More decking substructure here around the pool and built in braai area. Entrance deck is nearing completion, hadn’t yet received its Cork-tree hole. But planter box is in as well as the trellis screen which will get a creeper as part of the landscaping plan. 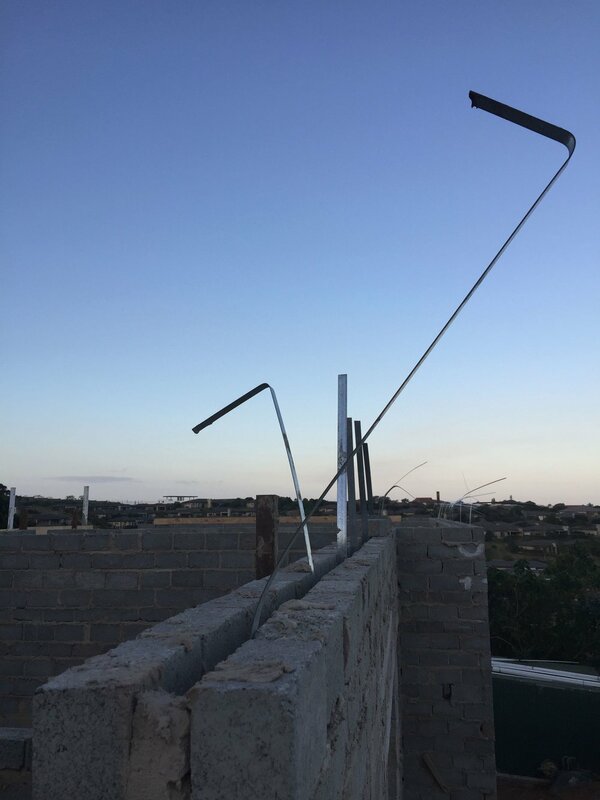 Garage portal timbers have received their horizontal timber girts. BIMx screenshot of the timber stripping cover pieces for discussion on site. Kitchen is open plan to dining area with a behind the wall scullery and wash up. Sketch of proposed pendant and fan placement done on site. Master en-suite with more resolution. Dark tile lower half offset by lighter off-shutter concrete soffits and walls. Pool deck nearing completion and Balau balustrade going up as well. Towards the end of this month the garage portal wall was almost complete, polycarbonate went up and a lot of discussions ensued on the amount and type of timber stripping required. Back of house gets a small post and rail retainer fence. We ended the last post with the polished concrete floor, we’re starting this post with another image of this floor. The stone aggregate in the concrete seems somehow to swirl and shoal like fish. Paint primer coats are going on as well as colour swatches for final paint. Greys and off-whites are the call. There are contractors crawling all over this project now. 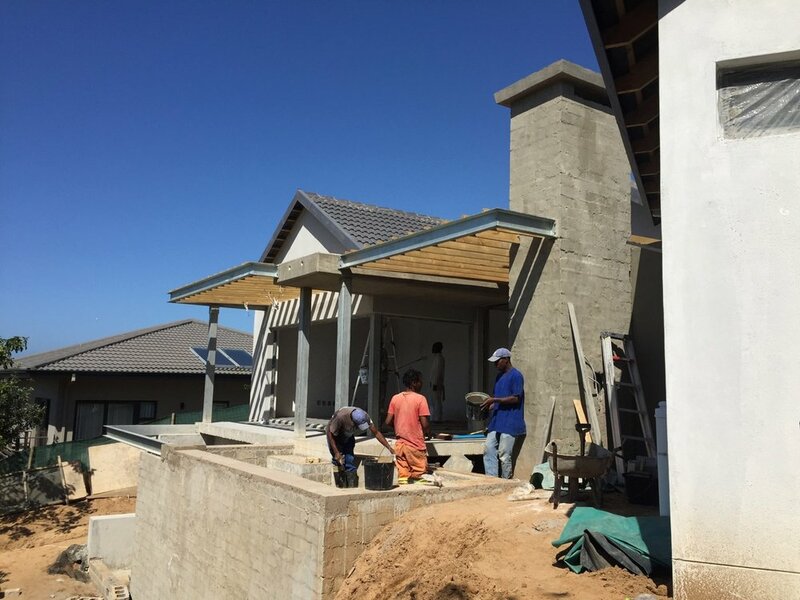 Finish plaster, painting, decking and carpentry. The raked chimney flue mentioned in the previous post is now evident, the stone cladding will come later. Pergola hot dipped steel will get a dark painted finish still. 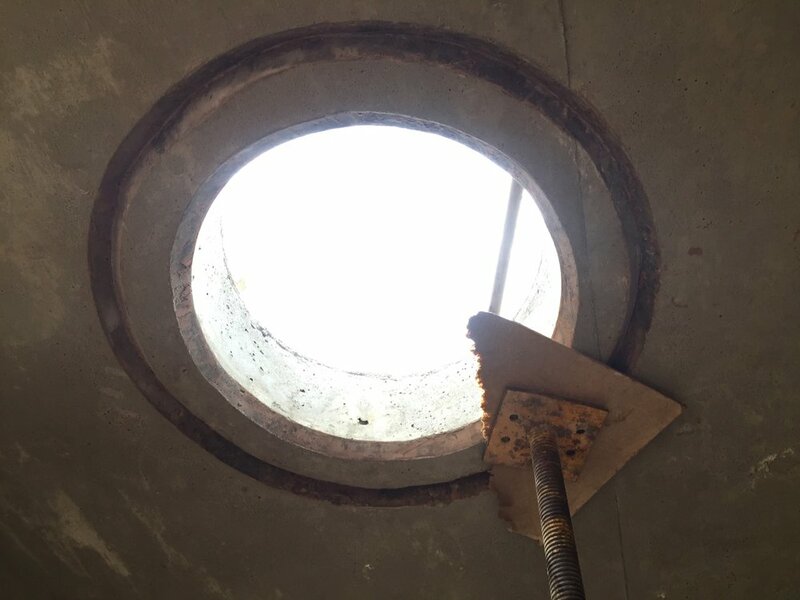 The polished concrete floor is contiguous with the shower pans which will also be a case concrete and polished but with a slightly different aggregate mix to differentiate them. 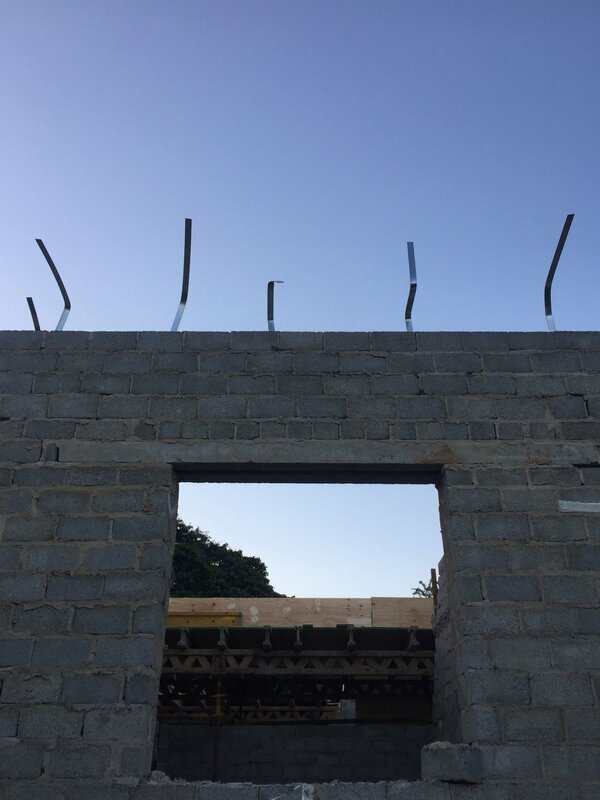 The negative corner is getting more steel and the deck frame emulates the pergola frame. 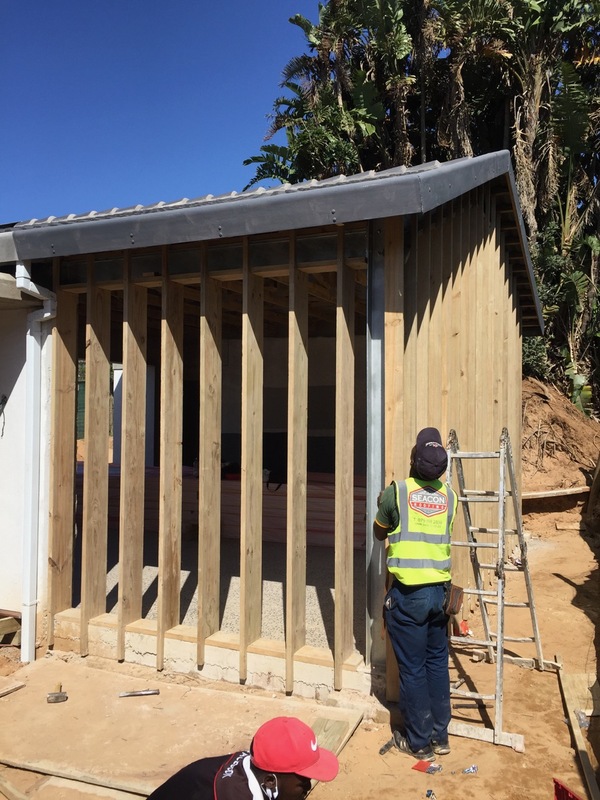 Garage portal end is clear of any structure, timber uprights with clear polycarbonate sheeting fixed externally to create a weather tight wall and timber stripping on top of that is coming next. This becomes a light composite wall with translucency on the forest edge. 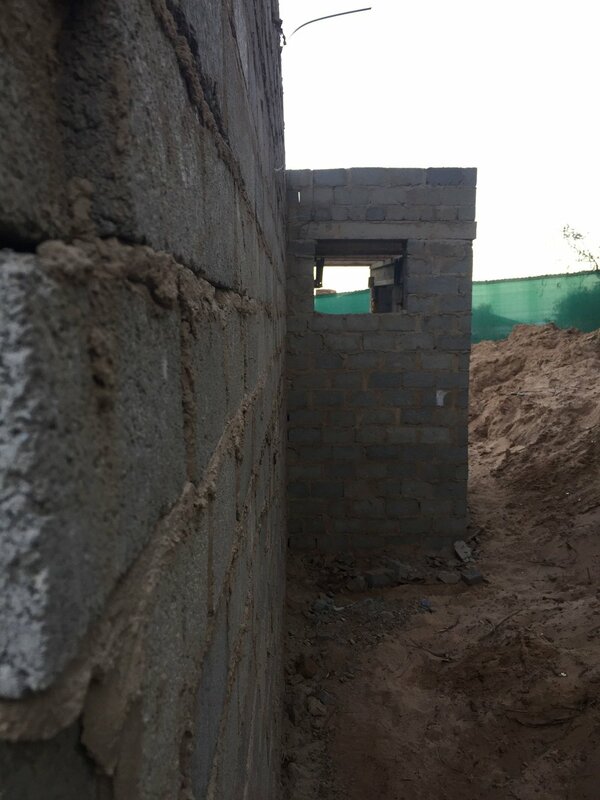 Main en-suite getting some finer details. 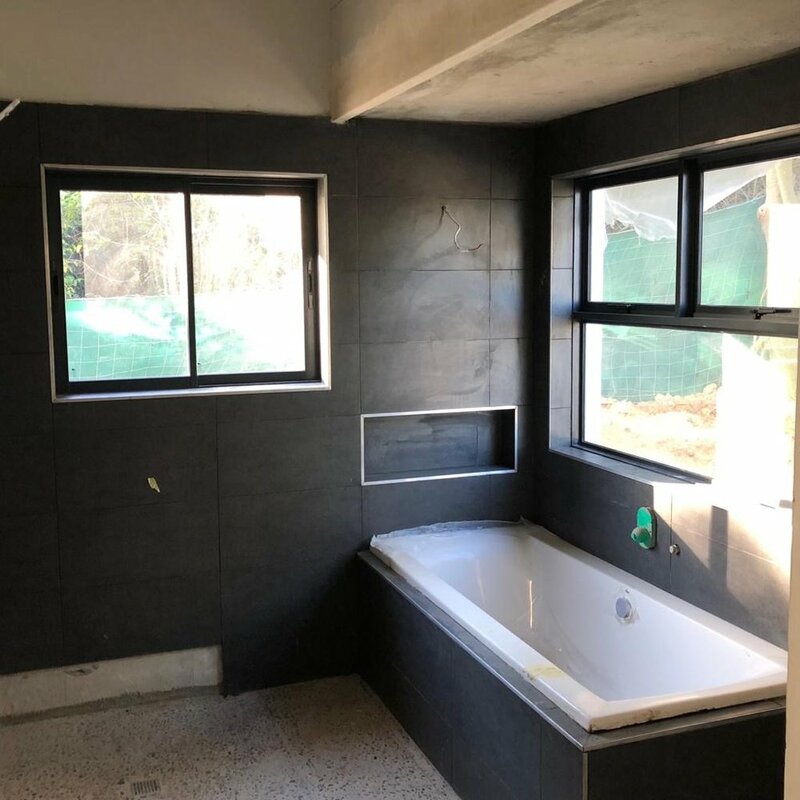 The bath has a lowered window and the shower an elevated window to provide views of the forest. Timber verticals fill the garage portal. ground floor plate, under portal timber plate and two horizontal girts (still coming) secure the timbers. The centers are set to match the IBR 686 profile sheeting. Decking substructure is going in. Soil is stabilized below decking, a geosynthetic fabric dressed on that (Bidim), and covered with a crusher course. All decks have rain drains to fall below them. Saw some sketch details coming together for items such as the timber handrail and guest loo vanity and stone basin. 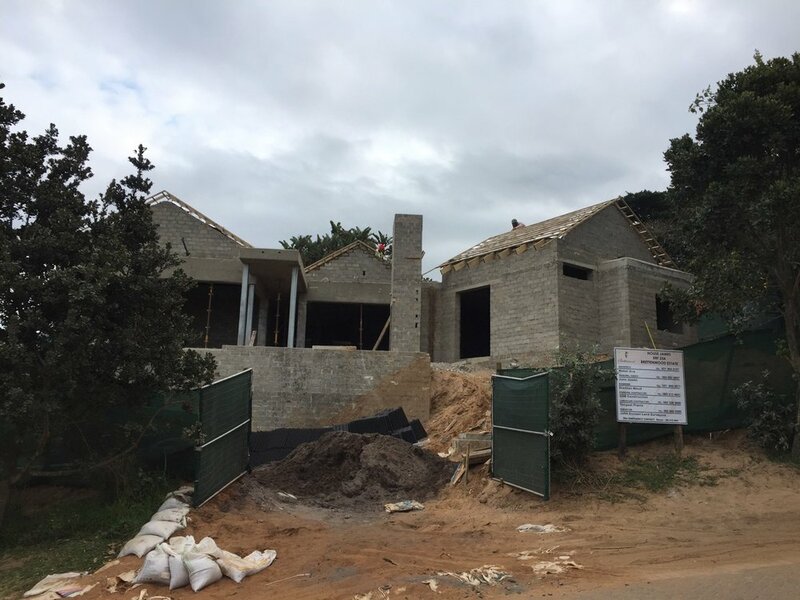 Roofing tiles arrived on site, Marley homestead in grey seen stacked. 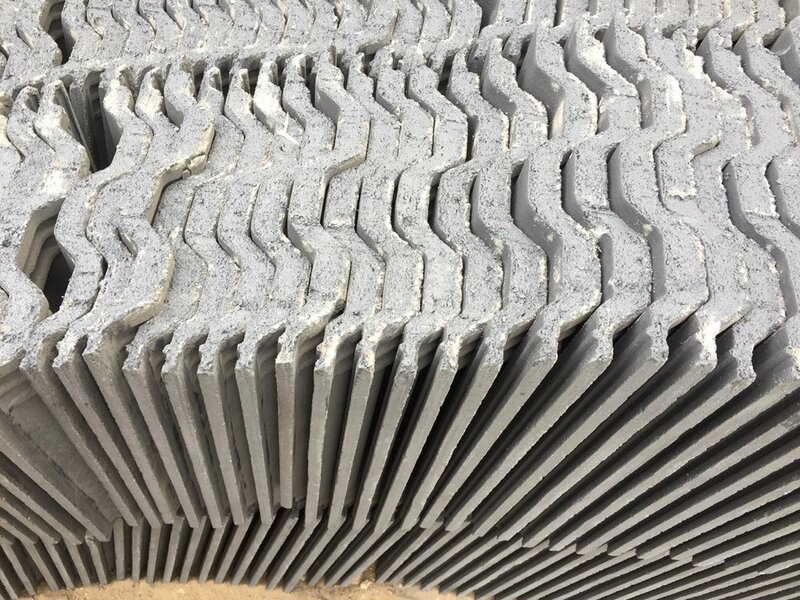 The profile of this tile meant not much breakage when handling. Roof beam-fill was being completed, throwing bricks on site has always being fascinating. 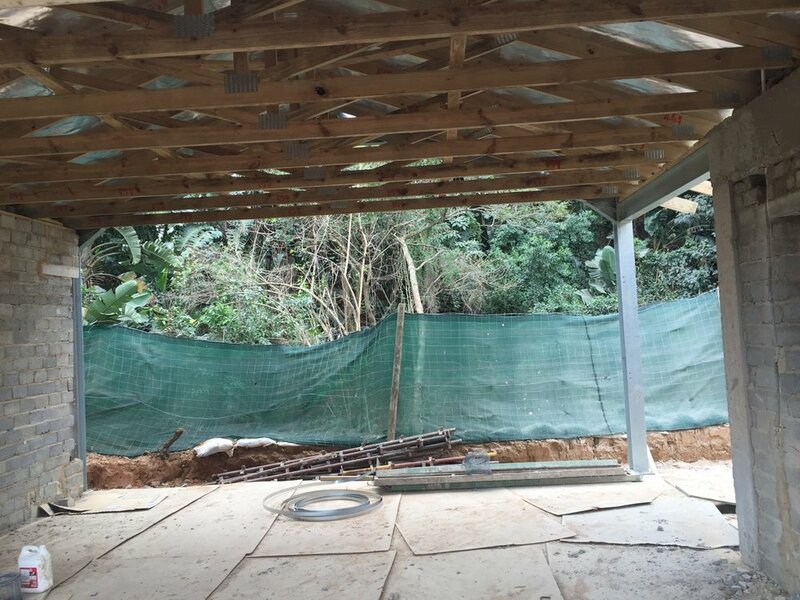 Shuttering for concrete roof slabs is recently off. It’s a straight off-shutter finish using standard shutter ply but new unused sheets. Garage portal is evident, incorporating steel to alleviate loading near the original bluff slope. 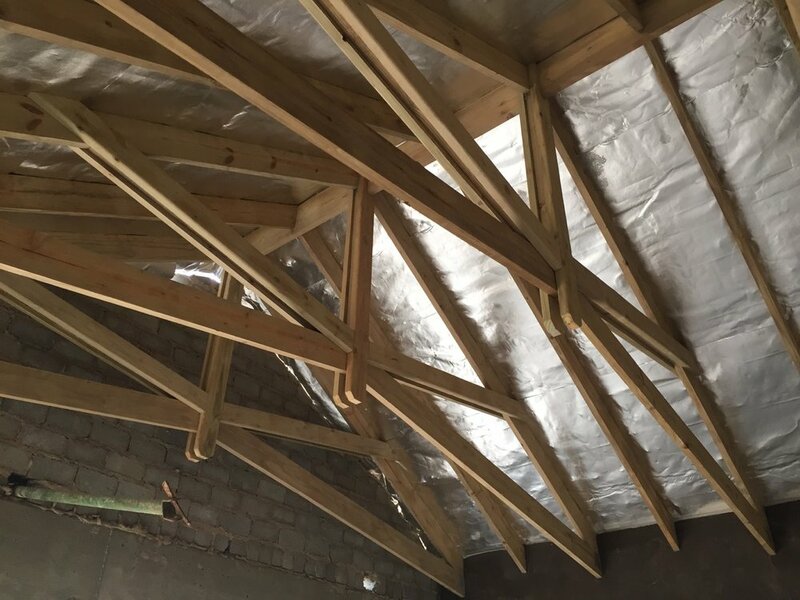 Standard trusses been used here. 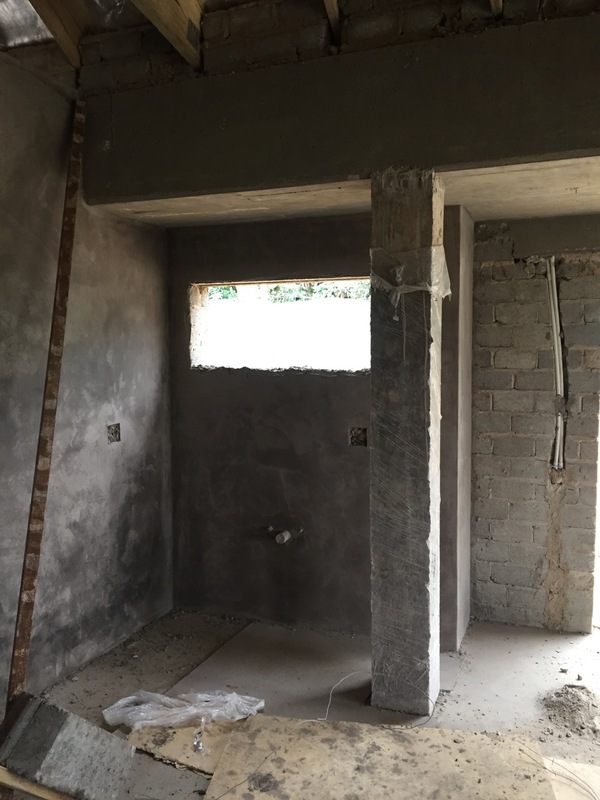 Internal plaster underway incorporating Pratliperl® Pearlite® plaster add-mixture which aids in spreadability as well as thermal performance and fireproofing. Looks gorgeous when still wet as shown here. 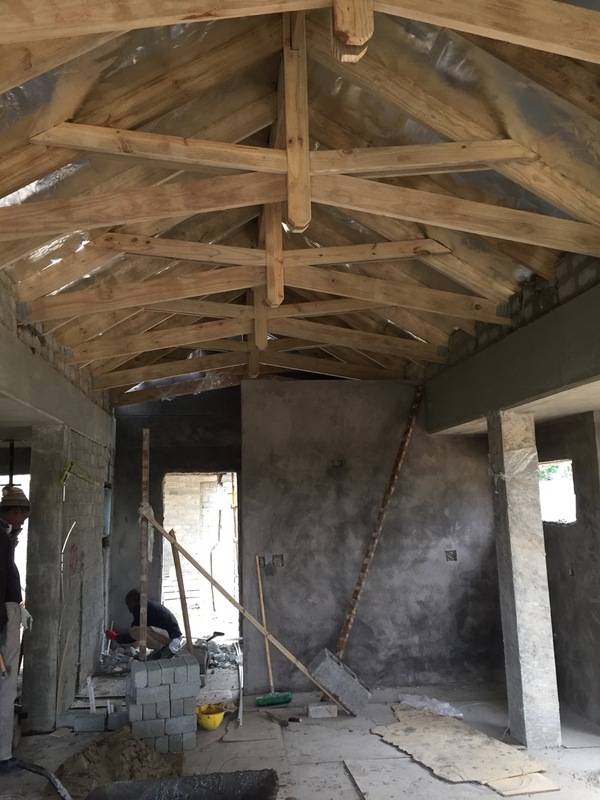 Internal trusses in main living volumes are a compound scissor truss at 30º pitch at 1500mm centers with rafters in-between sitting on a ridge beam between trusses. 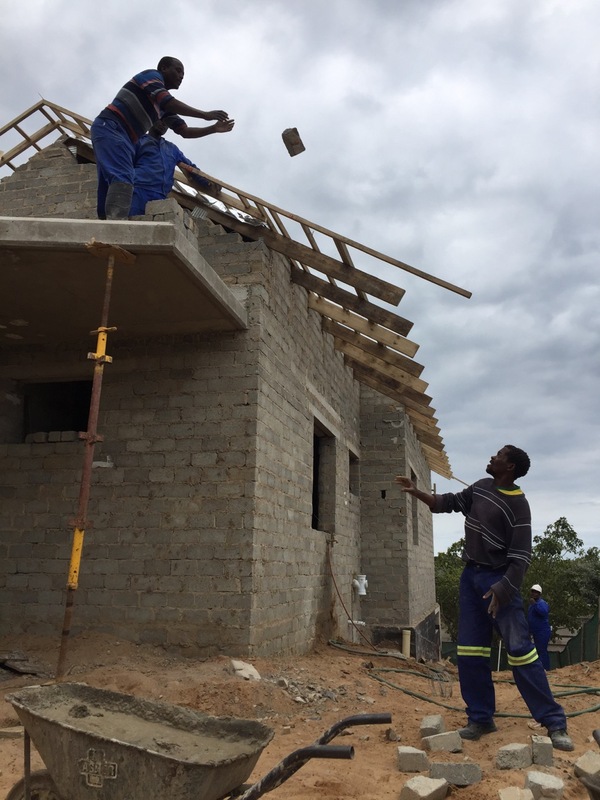 This sets up the rule-of-thumb centers of approximately 760mm for trusses used on a tiled roof. 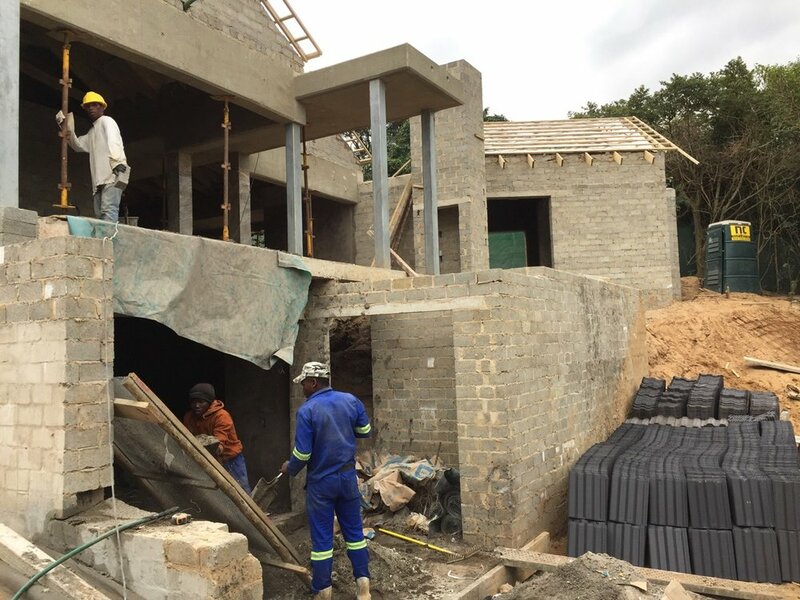 Double sided radiant barrier under tile is specified for climatic zone 5 (Durban) to aid with SANS 204 compliance. 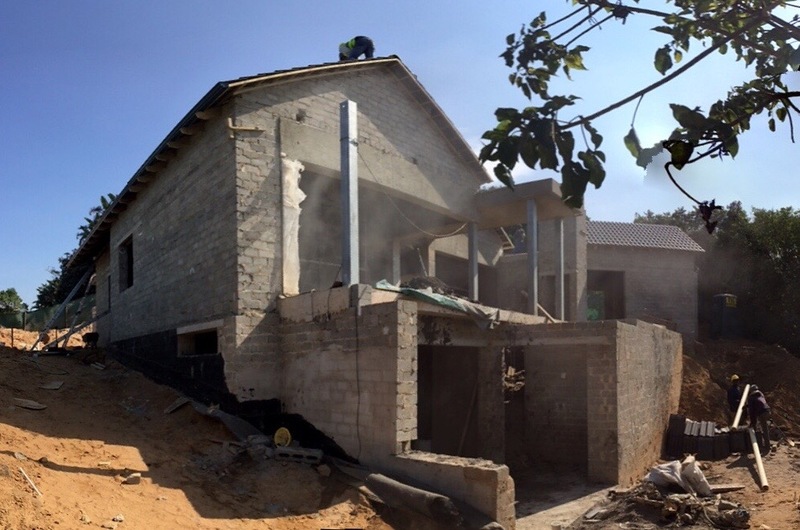 Building volumes and therefore overall roof apex height have been reduced by breaking main accommodation into 3 separate roofs. The volumes are then derived as roof height been 1/3rd the height of the volume below. More on that later. It breaks down the architecture of roofs and adds to the forest skyline behind the home. 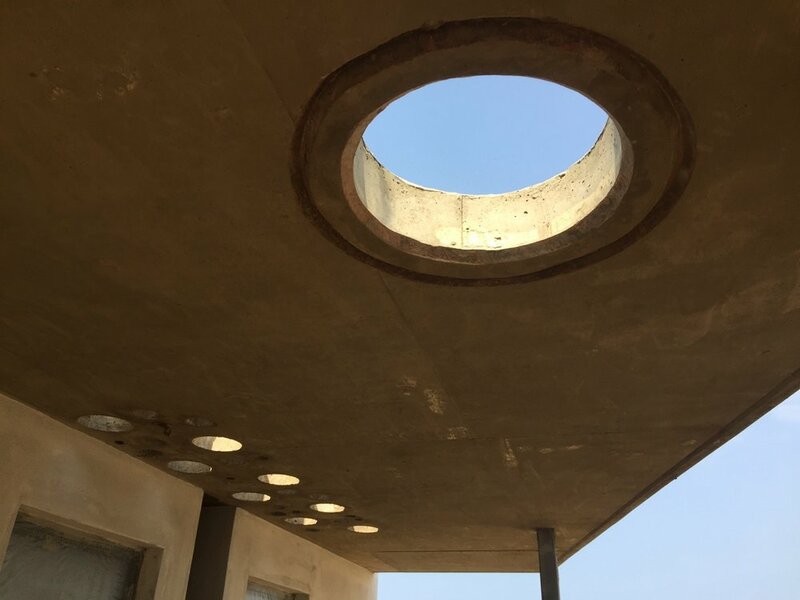 The flat section of roof between the two pitched voids also acts as visual entrance leading ones eye to the distant view once entering the home. Images screen gabbed from BIMx® on site were used to discuss screening details. One for the two WCs that have fenestration on the entrance facade and the other a pivot screen separating physically but not visually the back yard from the home’s entrance. Light and shadow on site validate the forms and reveal the presence of built form in the environment. The East corner of this home is also the highest due to the site slope, the design incorporates negative corners, stepping down of elements and establishment of a ‘plinth’ using dark colours, shadows and cantilevers. 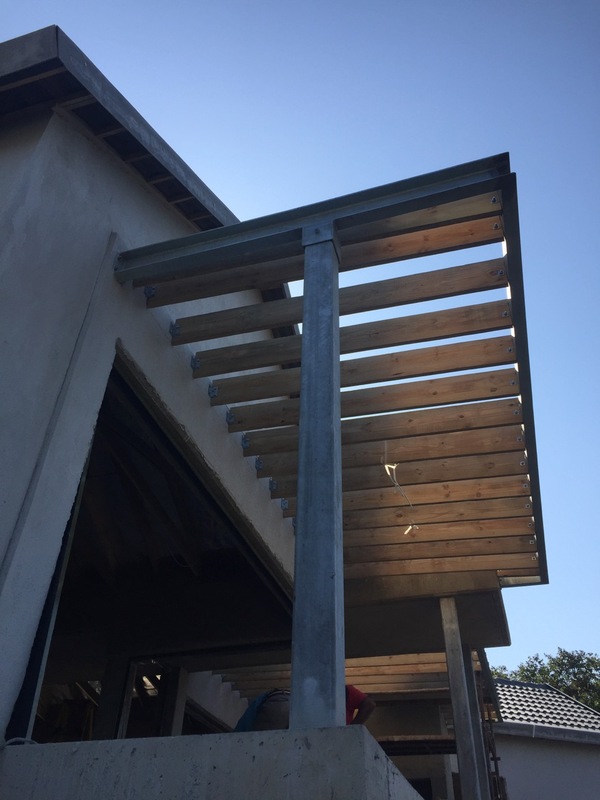 It’s lightly capped with a steel and timber pergola. Chimney needed some intervention on site. 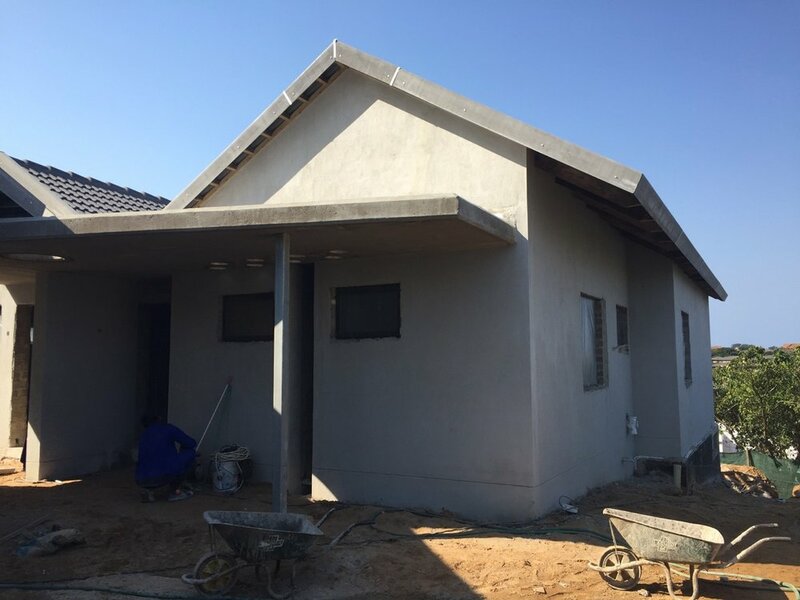 The capping was squared off, the design called for a raked profile to match the fascias which have the gutters hidden behind, The result can be seen later. Lastly the first reveal of the polished concrete slab, used throughout the home except where decking is used. On site it's all scaffolding for flat roofs and bare naked un-plastered walls at the moment. Foundations are in (Piling and some strip footings), External walls up to wall plate level and floor slabs cast and joints cut. Process upon process, but here's some formal representations for you in white model guise. It's all very sandy at this point, more excavations and piling to happen. But lets see where it all began with some initial design sketches to convey the intention. These are pen and ink drawings with a Copic® colour over. The design changed from these initial ideas but there's a continuity established here that remained, we'll post some of those next time. Materiality: was a driving theme in this design. Truth to materials and clever arrangement of them to create and at the same time fragment the form, especially along the longer elevation. Forms: The shorter elevation is characterised by ∆'s on 's with double pitched roofs on living spaces below. The vehicle housing was conceived as an open car port relating to the main dwelling in form using the same ∆'s but on more open screen type walls to reduce the visual scale. Siting: A unique site with only two neighbours and the Goulevan (Old Sugarcane Track) on the North, we attempted to nestle the building within the wedge shaped site, and allow vehicle access to the entry level. Your architect will be the guide who will assist you with conceiving, visualizing and realizing your end design. They will be there to bounce your ideas off of, to help define the theme of the project and to explore creative aspects of your building through sketches and 3Ds. 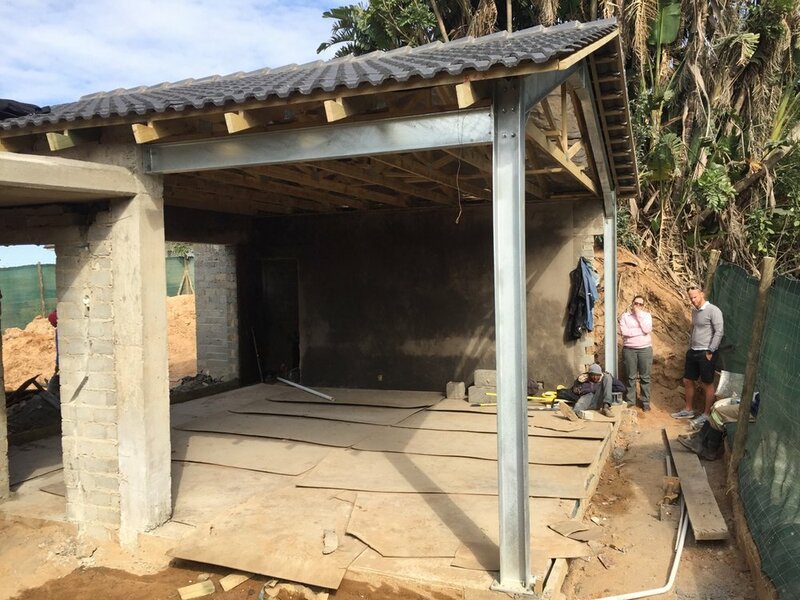 And finally, they will prepare all of the technical drawings and details to ensure that the builder puts it together properly! Do I need an architect?